VALMIKINAGAR: – Formally known as BHAINSA LOTAN, it is a famous tourist spot where a dam is built on the river Gandak (Gandak Project). This dam and its channels are the lifeline of north-western part of Bihar. This channel also irrigates some portions of eastern U.P. This dam is also generating hydro-electricity. This dam has been handed over to the nation by late Pandit Jawaharlal Nehru the then Prime Minister. For any tourist interested in exploring natural beauty, a visit to the sylvan surroundings of Valmilki Nagar is a must, where the gushing streams of Gandak break the ascetic calm of the Himalayan foothills. Bhainsalotan is also famous for Valmiki Ashram where Maharshi Valmiki, the author of the Ramayan is said to have passed some years. Lord Shiva temple, constructed by Bettiah Raj and ancient Shiv-Parvati temple is also situated here. 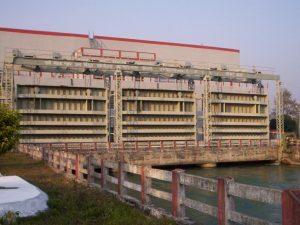 This is in the north-western part of the district under Bagaha-II Block and situated about five miles above the Valmikinagar dam. 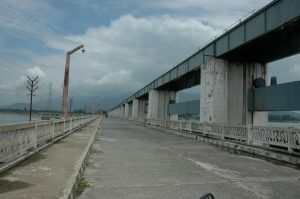 The confluence of river Gandak. Panchanand and Sonaha is an attractive place to see. This place is at the Indo-Nepal border. One bank of this confluence touches Triveni village of Nepal while another bank extends to Bhaisalotan village of India. The holy book “Srimad Bhagwat” describes that the thousand years battle between Gaj (Elephant) and Grah (Crocodile) was started at this place. Lord Vishnu appeared and protected the elephant. Every year a fair is held at this holy place on the eve of “Magh Sankranti” (Magh is the 11th month of the Hindu lunar calander and ‘Sankranti’ refers to the period of time when Sun enters into a new sign of zodiac. This occasion is also known as bathing festival in holy rivers. Thousand of devotees including old, women, children take the holy dip in this confluence. BAWANGARHI :- A name meaning 52 forts, given to the remains of some old fortifications near Darwabari in Bagaha-II block about 8 Kms. from Tribeni. The place is also called Tripan Bazar . The remains of the 52 forts and 53 bazars are at a short distance to the north of the village. To the north-west across the swamp are remains of massive embankments which may perhaps have been intended to serve as reservoirs. No trustworthy informatrion is available as the history of Bawangarhi though legends abound. 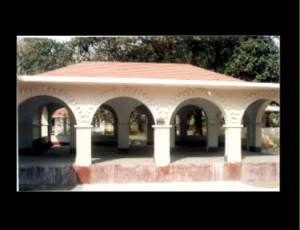 BHIKNATOHARI:- A beauty spot located in Gaunaha block on the northern part of the district, is the last railway station on Narkatiaganj Bhiknathori section. Located in the midst of beautiful scenery, it gives a clear view of the snow capped Himalayas and the Annapurna peak in the winter. King George V had visited this place for hunting. An attractive bunglow is still existent here. SUMESWER:- A fort is situated on the summit of the Sumeswer hills, at a height of 2,884 feet above sea level, in Ramnagar block. The fort which stands on the edge of a sharp precipice, is now in ruins, but its remains are well defined and reservoirs cut out of the soild rocks, in which water was stored for the use of the inhabitants, can still be seen. From the ridge upon which Fort Sumeswer is situated. a magnificent view of the snow and of the intervening valleys and low hills situated in Nepal can be seen . The ridge here forms the boundary between West Champaran and Nepal. The great Himalayan peaks of Dhoulagiri, Gosainthan and Gaurishanker are all clearly visible, and the view is said to be, for extent, one of the finest obtainable from any place on the frontier line India. BRINDAVAN:- Situated at a distance of 10 Kms. from Bettiah, in Gaunaha Block, this village had the honour of being the venue of the annual conference of ‘All India Gandhi Seva Sangh’ in 1937. It was attended by Mahatama Gandhi, Dr.Rajendra Prasad and Shri J.B. Kripalani. From that time a basic school founded by Gandhiji, has been functioning there. BHITIHARAWA ASHRAM:- It is a village in Gaunaha block from where Gandhiji started his freedom movement that came to be known as ‘Champaran Satyagraha’ in India history. 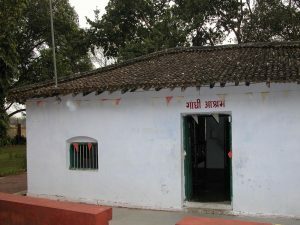 The village houses the hut which is called Ashram and has become a place of Gandhian pilgrimage. NANDANGARH AND CHANKIGARH:- Nandangarh is situated in Lauria block while Chankigarh is situated in Narkatiaganj block. These are actually two big mounds which are the remains of palaces of Nanda Dynasty and Chanakya, the world famous economist, Nandangarh has also been conjectured as the ashes Stupa where the ashes of Buddha are said to have been enshrined. 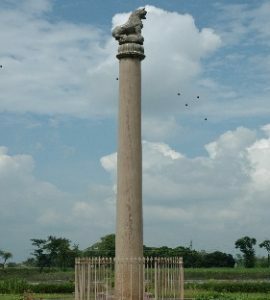 ASHOKA PILLARS:- About one kilometer east of Nandangarh in Lauria block is the lion pillar of Ashoka, over 2300 years old and is in excellent condition. This pillar is 35 feet in height and its base diameter is 35 inches and upper diameter is 22 inches. Its massiveness and exquisite finish furnish striking proof of the skill and resources of the masons of Ashokan age. Two more such pillars with their capitals removed have been discovered in Rampurwa village, close to Gandhi’s Bhitiharawa Ashram in Gaunaha block. One of their capitals, the bull is now in the National Museum at New Delhi and the other, the lion, is at Calcutta Museum. SARAIYA MAN:- Situated at a distance of about 6 Kms. from Bettiah town, Saraiya man is a lake which is a beauty spot. The water of this lake is considered salubrious for digestion because of black berries (Jamun) planted on its banks which fall in the water. The lake attracts large varieties of birds.